The people in the largely Catholic community of Fredericktown longed for a church in their own area. They overcame almost insurmountable difficulties, and through hard work and untiring efforts, their dream was realized when a new church was dedicated on October 15, 1883. Father William M. Buckman was appointed the first pastor (1883-1901). The people had previously walked or traveled by horse nearly five miles to attend Mass at St. Rose or at Holy Rosary at Manton. The old church served the community well for seventy-two years, but the parish outgrew the building. In 1955, a new church and rectory were built. The building, made of Bedford stone, was dedicated on April 15, 1955 and was large enough to hold 400 people. It has truly been the center of the community. Holy Trinity Parish had a Catholic elementary school staffed by the Ursuline Sisters of Mount St. Joseph from 1962 until 1972, when it was converted to a public school. The Ursulines served the community of Fredericktown by teaching in the public elementary and secondary schools from 1916 to 1978. Today this thriving parish consists of some 1,000 parishioners. Holy Trinity is a place where parishioners belong, care, work, and pray together. Activities embrace young and old alike. 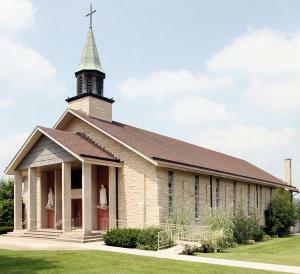 In 2003 the old auditorium was torn down, and the Holy Trinity Parish Center was built to accommodate further growth. It has proved a great asset to the community as well as to the school. Since the beginning, many people have worshiped and worked diligently for this wonderful, small and unique parish.